There are only a handful of things you need to make good barbecue. 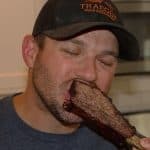 A good pellet smoker is the obvious #1, but coming in at a close second for me, is a good cutting board. If the cutting board is big enough, it can handle all of your prep and trim work before a cook, and all the slicing after a cook is completed. My wood cutting board is used almost every time I turn on my smoker. Because I use it so much – and because I want it to last as long as possible – there are a few simple cutting board maintenance steps I follow to keep my board in tip-top shape. I first talked about my cutting board in this post. 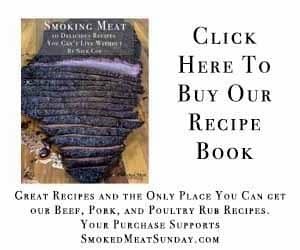 In that post I share a few of my favorite tools for smoking meat. Maintaining a wood cutting board is simple. The first thing you need to do is scrub your board with some warm soapy water. Make sure you clean the top and bottom. 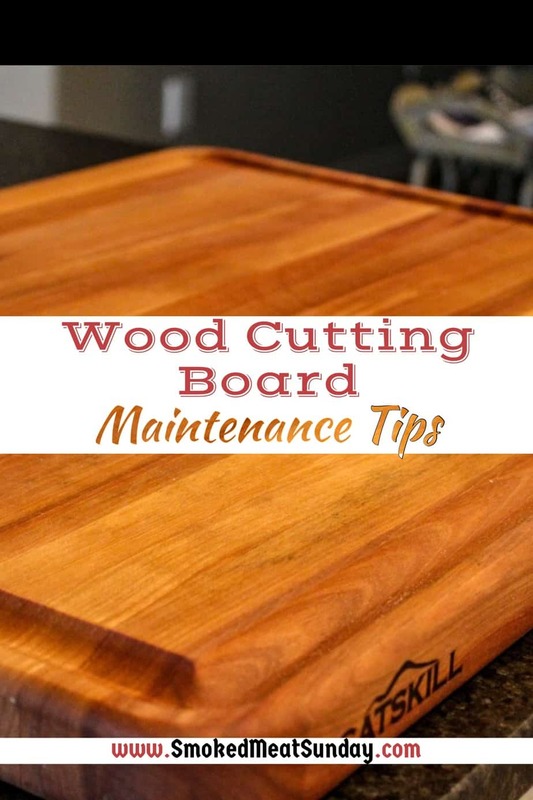 After cleaning the board, dry it off with a cloth or paper towel, and then let it sit in a well-ventilated area for about 15 minutes to make sure any excess moisture on the wood evaporates. I clean and wash my wood cutting board after every time I use it. This might sound like a no-brainer… but seriously, wash your cutting board after every use. Once a month give your board a deep clean. Sprinkle some salt on the surface of the board -coarse salt is best, but table salt will do if that is all you have. After you’ve sprinkled salt on the surface, take half a lemon, and scrub the entire board surface, squeezing a little juice out as you go. Let the lemon/salt juice sit on the board for a few minutes after the scrub. Scrape away the juice/salt, and then rinse the surface of the board with water. After you’ve cleaned the cutting board, it’s time to apply a light coat of mineral oil. I use boos mineral oil, but there are a lot of options available. I always apply a light coat of mineral oil on the cutting surface after I wash the board. This is a fairly straightforward process. Just squeeze a small amount of oil out on the board, and then rub the oil into the surface using a soft cloth or paper towel. Side note: there are a lot of different mineral oils available on the market. Make sure you always use food grade oil. Once you’ve finished with the bottom of the board, flip the board up onto one of its edges, and apply oil to the three edges that are exposed. Leave the board up on one edge overnight to let the oil soak in, and then wipe away any excess. You’re gonna want to come back to the mineral oil and apply it to the cutting surface… but not yet. First, we have to apply some beeswax. 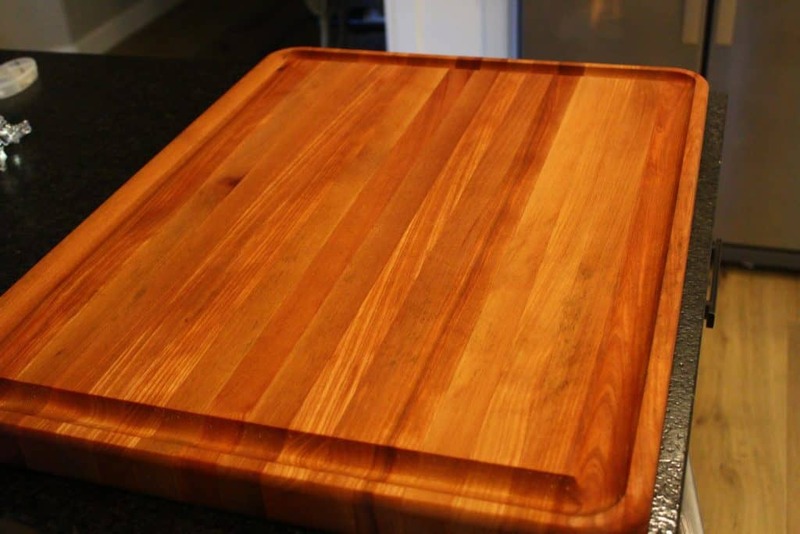 Once per month, you also want to apply a light coat of beeswax to the cutting board. 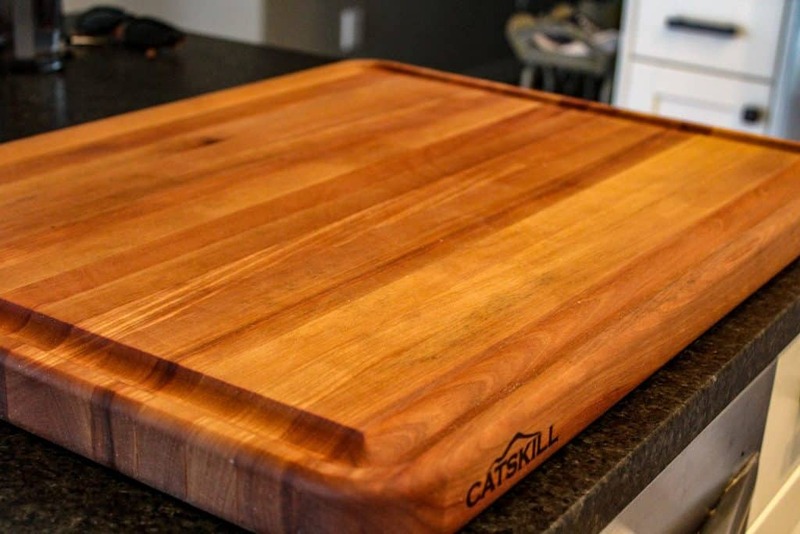 The beeswax will give your cutting board a nice lustrous shine. The beeswax will also help protect the wood from any moisture and food bacteria from seeping into the wood grain. First, apply the beeswax to the underside of the board, just like we did when we applied the mineral oil. Once you’ve applied the beeswax, buff it out with a soft cloth. Repeat the process on the edges of the board, and then flip over to the cutting surface. Don’t forget to apply some mineral oil first if you haven’t already! Then apply the beeswax, and buff it out. The same steps outlined above can be used to take care of your wooden spoons and rolling pins. Every now and then you might notice the cutting surface of your board getting some deeper grooves in it. Fixing these and giving your cutting board new life is easy. Before you start the process of removing the knife marks, wash down the surface, and let it dry. Then, using 50-grit sandpaper, sand away the surface of the board until the grooves are gone. Go back to the surface a second time with some 100-grit sandpaper to make it super smooth. Now that the surface is smooth and knife groove free, apply some mineral oil. That freshly sandpapered wood is going to soak up the oil. You’ll probably need to give it a few coats before the oil stops seeping in. When the oil starts sitting on the surface, you can apply one last coat, and then follow it up with some beeswax. A large wood cutting board is one of the best investments you can make if you are serious about barbecue. If you take care of it, following the steps I’ve outlined above, your wood cutting board should last for years! I hope you’ve enjoyed reading about wood cutting board care. If you have any advice or things you do differently to make your wood kitchen utensils last, leave a note for me in the comments.